The following is a volunteer newsletter from the Gerard Kennedy campaign. Emphasis is mine, you can skim the rest. I dropped into the new office at 2920 Dundas West today at 11 o’clock. I’d been out of town for a week and the last time I saw it was when we were looking for a new location for what was to be the Liberal Riding Association campaign office. Wow … what a change! From a vast empty space punctuated with furniture lying around willy-nilly, 2920 was transformed into a bustling campaign office. Gerard had just returned from the Terry Fox Run (he thinks he finished in the first ten, but only time will tell if that was just wishful thinking). He was scouting around for a place to take a shower so he could take off again smelling more like an MP than a marathon runner. Campaign manager Jason Easton had staked out his office space under a giant map of the riding. He, like everyone else, was surrounded by files, facts and figures. Karin McNair informed me that the week had been really busy. For one thing, she needed folks to look after the phones and reception desk. She’d ended up doing a lot for that herself during the previous few days. While I was there Chandra came in to help out. Karin is still looking for volunteers at reception, especially for the evenings. Ruth showed me the phone banks we’re hoping to fill with eager telephone volunteers. Gerard had been out canvassing the day before, and had also been at the Ukrainian and Polish festivals. He had a list of people who wanted to put up lawn signs. Karin was registering them and trying to figure out the best way to get the signs onto their lawns. Her big problem was the people who want big signs. We really need some folks with SUVs or small trucks to deliver the larger size signs. Veronica Wynne flew in briefly to pick up some signs and literature. She was on her way down to Boor West Village to encourage people to sign up for the Carbon Challenge. Even with the election preparations in full swing, we still have to get the word out about reducing our carbon footprint. In the meantime, Ruth was posting her “Wish List” on the office door. For what is she hoping? Another small office table at which more people can work, a small couch and possibly some folding chairs. And ever mindful of the wellbeing of volunteers, Ruth is also hoping that sometimes people will stop by with sandwiches or snacks! There is lots of activity and lots to be done. I need to get up to speed on the urgent need for poll captains, for instance. And a meeting regarding fundraising is scheduled for tonight, as well as a general planning meeting to follow. Things are buzzing at the campaign office, but they’d buzz a bit louder if you were there. There’s an awful lot to be done! Kennedy, however, says the fundraising venue was completely paid for in a transaction with GlobAlive Communications Corp, a telecommunications company that started the Shamba foundation. He said the invitation incorrectly identified the venue as the charitable foundation, creating the confusion. Kennedy said the only connection with the SHAMBA foundation was that the space has become associated with the charity because the group uses it. He said GlobAlive rents its spaces – including that site – commercially to both charities and private users. “It certainly smells like a desperate kind of attempt by the Conservatives,” Kennedy told Canwest News Service on Sunday night. Desperation? I imagine that conservatives like myself, and indeed, I’m certain that most everyday non-Liberal-membership-card-holding Canadians, are concerned about the equal application of the rules concerning partisan fundraising so that it is done above board. Kennedy, as Globalive’s PR people did when they called on Friday, blamed erroneous Facebook promotion of the event. Later, the official registration form for the SHAMBA/Kennedy event surfaced making the excuse harder to believe. OTTAWA – The Conservative Party today asked the Canada Revenue Agency’s charities directorate to investigate another potential partisan Liberal fundraiser held at the SHAMBA Foundation in downtown Toronto. SHAMBA is headed by Anthony Lacavera, a prominent Liberal donor who has contributed in excess of $4,700 to Liberal Gerard Kennedy over the past 2 years. Conservatives have learned that on August 16, 2007, the SHAMBA Foundation hosted a $500 per person fundraiser for the Ontario Liberal Party. The fundraiser featured an appearance by Ontario Premier Dalton McGuinty. According to the Canada Revenue Agency, registered charities such as SHAMBA are not permitted to directly or indirectly involve themselves in partisan political activities. This new information about partisan Liberal fundraising at SHAMBA comes on the heels of information released June 1, 2008 which revealed that SHAMBA recently hosted a $250 per person fundraiser for federal Liberal intergovernmental affairs critic Gerard Kennedy. According to documents posted on the Liberal Party’s website, the Kennedy fundraiser was identified as a “Political Ideals Celebration” and the registration form for the event was co-branded with Liberal Party and SHAMBA Foundation brand identities. Conservatives have already written to both Elections Canada and the Canada Revenue Agency to investigate the Kennedy fundraiser. Given the SHAMBA Foundation’s raison d’etre is to provide charities with no-cost event space and negotiated rates on food and beverage, Conservatives want to ensure that Kennedy did not violate Elections Canada’s rules by receiving an illegal non-monetary contribution from the Foundation. “We need answers from both Liberal candidate Gerard Kennedy and Liberal donor Anthony Lacavera about their partisan Liberal fundraising,” said Conservative MP Dean Del Mastro. When Globalive’s PR people called me on Friday, I noted the firm’s name and offered to post it to give them credit for doing their job (cleaning up a mess). They said that it wasn’t necessary and that I could just say that Globalive’s PR people contacted me. However, I didn’t put it together at the time but Narrative – a company owned by Bensimon Byrne – made the call of behalf of Globalive/SHAMBA. Bensimon Byrne was the firm contracted to make Liberal Party attack ads during the 2004 and 2006 campaign. The ads (especially the aircraft carrier/teenage girl abortion/disintegrating flag spot) was a particularly – “desperate kind of attempt” – as Gerard Kennedy might say. When a political fundraiser titled Political Ideals Celebration is held on space that is the raison d’être of a charitable organization and it is billed in this way, alarm bells go off. Did the head of the SHAMBA foundation give permission for the organization’s branding to be used along side that of the Liberal Party, of Gerard Kennedy? Presumably, the head of SHAMBA would have seen the registration form. Being the head of a charitable organization, did he make attempts to change the branding of the event? Asked about the amount of money Globalive invested in Shamba, Lacavera described it as “sizable” and reluctantly put it “well into the hundreds of thousands of dollars,” adding that it would likely cost “tens of thousands of dollars” to rent out a similar venue for an event. If Kennedy paid fair market value for the space, did it cost him “tens of thousands of dollars”? Does the SHAMBA foundation risk losing its charitable status? Gerard Kennedy, the former Liberal leadership contender and current Liberal candidate for Parkdale High Park is holding a fundraiser tonight in order to pay off his leadership debts. The fun part – and the cornerstone of the SHAMBA foundation – is the creation of a brand new 2,500 square foot rooftop terrace designed for fantastic events that raise money for great causes. The SHAMBA Space, as we call it, is available for local charities to use at no cost to host events. In addition to donating this exquisite space, SHAMBA also negotiates sponsorships with food and beverage partners to ensure that the bulk of funds raised at an event actually go directly to the cause. The generous concept is that of Globalive CEO Anthony Lacavera, a Gerard Kennedy leadership supporter according to data at Elections Canada. Gerard Kennedy, like some other Liberal leadership candidates, needs to pay off his Liberal leadership debts by June 3rd or else he will run afoul of Elections Canada. Anthony Lacavera seems like a good friend with a great foundation that is helping Kennedy pay off his debts. So what’s the problem here? The SHAMBA foundation is a registered charitable organization according to the Canadian Revenue Agency. Also, registered charities are prohibited from partisan political activity under the law. One hopes that Gerard Kennedy will move his fundraiser to a different venue because the purpose of the SHAMBA foundation is to provide free event space for charities. According to the Facebook page, the foundation is the location for the event. If the space is not being provided for free, one hopes that Kennedy is paying fair market value for event space that never seems to be rented for a fee. Even so, should this charity be mixed up with partisan political activity? UPDATE 5/30 4:30pm: Globalive’s PR people just gave me a call to admit that the Gerard Kennedy fundraiser was erroneously billed/described by the promoters of the event. The SHAMBA space is used for charitable events but for the intents of the Gerard Kennedy event the space should be thought of within the Globalive domain (a company) rather than that of the SHAMBA foundation (a charity); the Gerard Kennedy fundraiser took place on Globalive property rather than that of the SHAMBA foundation and though it is the same space the space takes different identities depending on the – or rather this – context. I was assured that Gerard Kennedy paid fair market value for use of the space from Globalive and that the space was not made as a donation from the company. UPDATE 5/31 5:55pm: Here is the registration form for the event (still live on the LPC(O) website). The form clearly has the logo of the SHAMBA foundation (a registered charity). This doesn’t seem to simply be an erroneously written Facebook listing. The event is officially billed as a SHAMBA foundation/Gerard Kennedy event. I think that the earlier PR call may have been a sort of after-the-fact damage control revision of history. Charities cannot participate in partisan political activity. This form from the Liberal Party website suggests that the SHAMBA foundation and the Liberal Party have an association. Posted on May 28, 2008 Author Stephen TaylorCategories OtherTags anthony lacavera, facebook, fundraising, gerard kennedy, globalive, liberal leadership, liberal party, political donations, shambaLeave a comment on Does the SHAMBA foundation risk losing its charitable status? Justin Trudeau to run in Outremont? I overheard at the convention last weekend that Justin Trudeau is considering a run in the riding of Outremont. I didn’t put much stock into the rumour, but this makes it more likely to be true (Romeo St. Martin reports that Jean Lapierre may not run again in Outremont). Further, could he sit as an MP under a Dion government given Dion’s hardline with soft Quebec nationalists? Also, perhaps Trudeau believed that Kennedy (and then Dion) were weak leaders to support so that the eldest son of P.E. 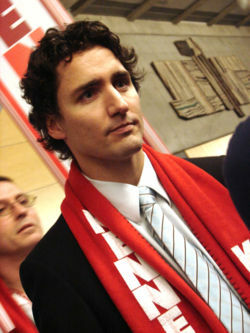 Trudeau could run for Liberal leadership in 2008. Trudeau would be a (future leadership) candidate that would run heavily on personality and the name “Trudeau”. Here’s Blogging Tories Television’s interview with him. I’m certain that it’s not a question of if but when and when may come sooner than we think if Lapierre’s vacating of Outremont (again, perhaps because of Dion) is true. A Justin Trudeau run in the riding of Outremont? You heard it here first. Posted on December 5, 2006 Author Stephen TaylorCategories OtherTags 2006 liberal leadership convention, gerard kennedy, jean lapierre, justin trudeau, pierre trudeau, stephane dionLeave a comment on Justin Trudeau to run in Outremont? I ended up at the sparsely attended late night Kennedy hospitality event last and had a chance to meet him. This weekend Kennedy was the kingmaker as he backed Stephane Dion which essentially helped secure his victory for leadership. Tasha asks Kennedy why he backed Dion and kind of gets an answer. Dion vs. Ignatieff on the final ballot. These are two candidates that we as Conservatives can run well against in the next election. Many thought that Rae was the preferred candidate but what I gather, Rae was the Conservative’s most feared candidate. It’s argued that it’s been long enough for Ontario to forget about Rae. Also, Rae would have polarized an electoral race left vs. right and right now, at least since the CPC is a minority government (elected with about 36% of the vote), the majority of the votes lie outside of the Conservative camp. I’m certain that Ignatieff was Conservatives’ most preferred candidate to face as what makes Iggy controversial is indistinguishable from what makes Harper controversial to some Canadians (Afghanistan and anglospheric foreign policy). Ignatieff also suffers from foot-in-mouth disease and there are plenty of gaffes that he’s made in the past and will likely make in the future. Iggy is the most conservative candidate and you might as well vote for the conservative in power. Further, the Liberals have always played the anti-American card on the Conservatives. An Ignatieff victory would have nullified this old Liberal standby. Out of the top four, Kennedy would have been the dream candidate due to his inexperience and alienation of Quebec (his lack of french and his “nation” position). Kennedy though was a bit of a long shot. Out of the top eight candidates Volpe would have been our favourite candidate. It’s not even necessary to explain why. Dion is the grassroots candidate that Liberal party members have promoted to tell the party’s old guard that they will not have another leader thrust upon them. Dion’s schtick is the environment. This isn’t as big of an issue (yet) and it’s really the main thing that he ran on. Dionistas (or Dionkeys as their opponents here call them) are waving green Dion signs to contrast against the Liberal red. Green may as well be a safe apolitical colour that Dion could use. However, Dion’s record on the environment is mostly hot air. He banged that gavel at the UNFCCC to be sure, however, GHG emissions under the Liberal government rose over 25%. Further, conservatives won’t lose any of their base to Dion because of any claim of environmental credentials. Dion also isn’t the type of leader that can charge a base of support and lead them into battle. Stephane Dion is a quiet intellectual who would seem to shy to be sucessful in rallying the troops and the swing voter. The final ballot results are coming in. I’ll update in a bit.